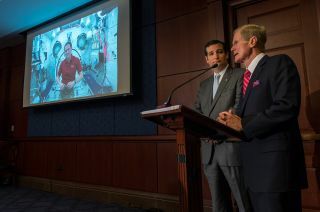 U.S. Sen. Ted Cruz, R-Texas, left, and, U.S. Sen. Bill Nelson, D-Fla., talk, via a live downlink, to NASA Astronaut Tom Marshburn onboard the International Space Station (ISS) during a NASA briefing with the U.S. Senate Committee on Commerce, Science, and Transportation, Tuesday, May 7, 2013, at the U.S. Capitol in Washington. A NASA astronaut sees his work aboard the International Space Station as a means of bringing humanity a little closer to setting foot on Mars. During a 25-minute webcast Tuesday (May 7), members of the U.S. Senate Committee on Commerce, Science and Transportation’s Subcommittee on Science and Space asked NASA's Tom Marshburn to delve into the science, downtime and other parts of life on the space station. For example, understanding how to recycle resources efficiently in Earth orbit could lead to life-support systems that help send astronauts to Mars or farther out into the solar system, Marshburn said. Life in space also changes the perspective of people living on the International Space Station, Marshburn added. "I wish every head of state around the world could come see our Earth from the cupola," Marshburn said of the Earth-observing glass structure on the bottom of the station. "It's a 360-degree view ... I've found that I've fallen in love with the Earth again. It's almost impossible to pull your eyes away from it." Although looking out the window is one of Marshburn's favorite pastimes on the station, crewmembers are usually too busy to stare back at Earth during their work hours, he said. Marshburn told members of the subcommittee that his days in orbit are filled with science. The astronauts are responsible for conducting more than 100 experiments on the orbiting laboratory. "What surprised me was that how busy and vibrant life and the work here is on the space station," Marshburn said. "The space station is a hard place to go to sleep. There's a lot going on up here. There's so much going on up here that it's hard to stop." But it isn't all work and no play for the astronauts. The crewmembers hold informal competitions that are very specific to life on the space station, Marshburn added. Oftentimes the six residents of the station will try to float through a module without touching a wall just for fun.